Type: Lithium. Nominal Voltage: 9V. Depth: 17.5 mm. Width: 26.5 mm. Height: 49.0 mm. Price: £5.75 each. £5.50 each if you buy two or more. Postage and packing included. The Li9V / U9VL / L522 brings a new lease of life to the popular 9V block with snap terminals format. The Li9V / U9VL / L522 lasts up to 4 times longer than ordinary alkaline 9-volt batteries and 10 times longer than carbon-zinc batteries and operates over a huge temperature range. 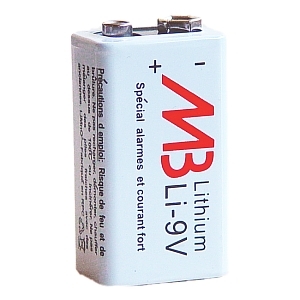 Lithium Manganese Dioxide chemistry is used in the Li9V for the very longest in-service life and for unparalleled shelf life. The Li9V has a novel internal construction that is optimised for both high and low drain applications and can supply a maximum load of 120mA. The Li9V battery can keep your ionisation-type smoke alarms working for a full 10 years! And are ideal for carbon monoxide alarms and security systems too. Any application that can benefit from longer battery life can take advantage of the Li9V which has found favour in a variety of medical applications (such as ambulatory infusion pumps, telemetry systems, blood analysers), and wireless microphones, transmitters; anywhere that extra long battery life is a bonus. These 9-volt lithium Li9V / U9VL / L522 batteries have a long shelf life, well in excess of 10 years. Why not buy two or more packs, take advantage of our reduced price and make sure you are not left in the lurch next time your battery runs out. For a conventional alkaline PP3 battery, click here to consider our high performance PP3.